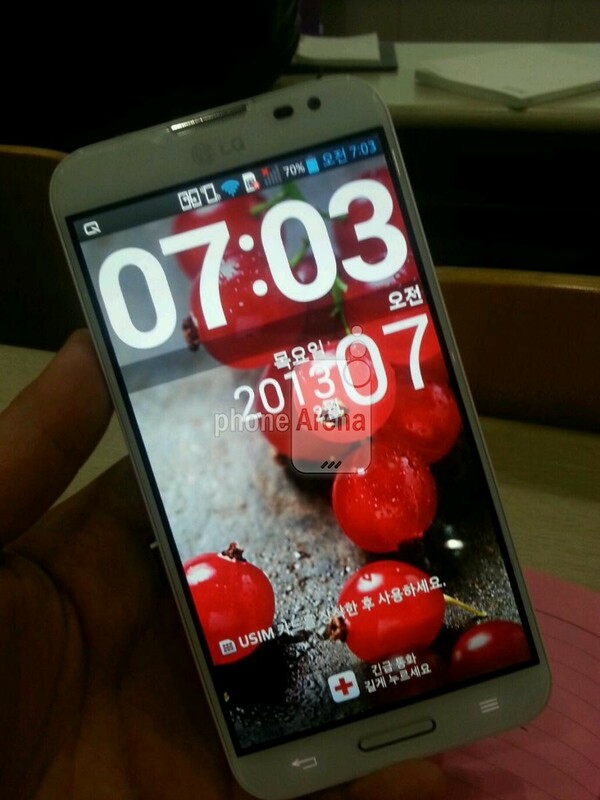 LG Optimus G Pro for NTT DoCoMo. We've actually had a little look at the LG Optimus G Pro before, it's pictured above in the form that it took when it was announced for NTT DoCoMo, but up until now we've not really known what the international variant would be looking like. So with only a couple of weeks until MWC 2013 rolls round LG's top of the range phone has been photographed! The device itself, pictured right, looks aesthetically as though it'd be a good competitor to the Sony Xperia Z and the currently unannounced HTC M7 and Samsung's Galaxy S IV! 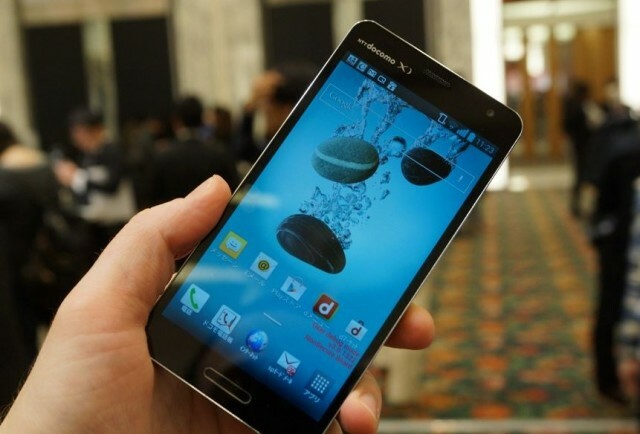 Despite the obvious similarities with the Samsung Galaxy Note 2! Interestingly we've also got a spec sheet for this device and we're impressed, but at the same time slightly hesitant because of the size of this device. Instead of going with the expected size range of somewhere between 4.8" and 5", LG has opted to equip the G Pro with a Full HD, that's 1080 x 1920p AH-IPS display! It looks, to us, as though LG have opted for a super slim bezel which should help to make this phone pocketable and easy to manage for people without giant hands! 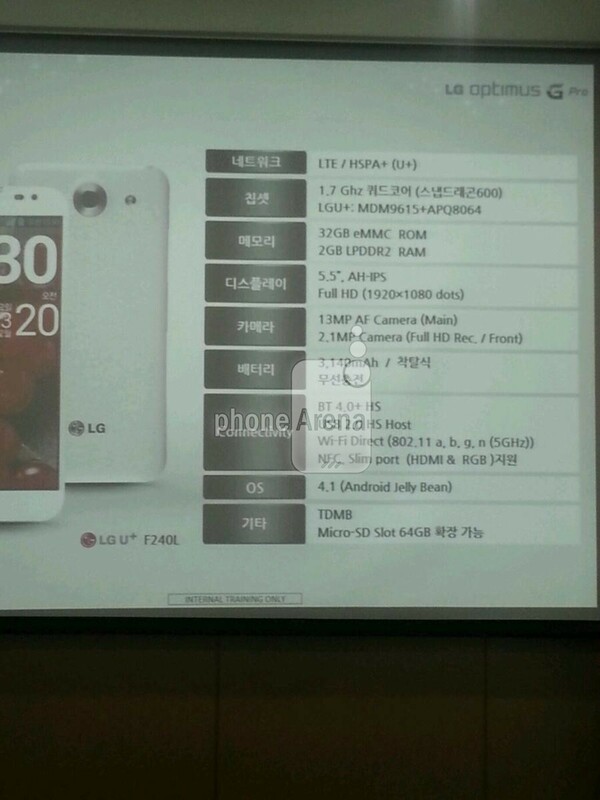 Other than that the spec sheet, embedded below, shows off the other specs which we can expect to see and as you would expect from a flagship this one will be no slouch. There's a 1.7 GHz quad-core Snapdragon processor with a LTE radio, a full 2 GB of RAM and 32GB of internal memory which is expandable with another 64GB memory card! There's also a 13 MP rear and a 2.1 MP front camera set up, both of which are capable of 1080 video. Unfortunately LG still can't bring themselves to launch a phone with the latest version of Android, there's Android 4.1 Jelly Bean on board and we can only cross our fingers and hope for an update when it comes to LG! The software can perhaps be overlooked when you consider that LG has packed this thing with a huge 3,140 mAh battery. There's some other interesting bits and bobs like the 'Slim Port' which does 'HDMI & RGB', but we're not exactly sure what that will do or how it will work, but it's no fun if LG doesn't surprise us with something at MWC is it?